The Annual Report is compiled and published each year to be ready for voters to obtain at the November election. A PDF copy is also posted online and available for viewing our downloading. The primary function of all departments of the Town of Franklin is Customer Service. To support this, we work to hire and retain the best employees possible. The Human Resources Department provides Customer Service primarily to applicants, active and former employees and retirees. During this fiscal year turn-over of staff has been high as we continued to see a transition in staff. Baby boomers retired and some employees have moved on to new positions outside Franklin. Three (3) Clerical staff, two (2) Custodians, four (4) Dispatchers, two (2) DPW workers, two Patrol Officers, four (4) Firefighters, and three (3) members of the professional staff resigned or retired. We were very sad to have one of our Full-Time Fire Dispatchers pass on unexpectedly. We were fortunate to be able to hire well qualified individuals as clerks (2), custodians (3), DPW workers (2), Dispatchers (4), Firefighters (5), experienced Patrol Officers (3), professional and support staff for various departments (4) as well as a new Youth Services Librarian. Hiring includes a transition of management in the Human Resources Department. As the fiscal year ends we are also finalized the hiring over thirty (30) high school and college students to work in temporary jobs or the summer in DPW or Public Facilities, working with full time staff to cut grass, pick up trash, move furniture, and clean classrooms. They learn a bit about what it takes to care for the Town schools, public buildings, and grounds, and provide a valuable service. There are many conversations about benefits with new hires, and questions continue throughout an employee’s time with the Town, as their lives change, and contact continues into retirement. Health Insurance continues to be a major focus of planning, budgeting and communication. Federal Health Care Reform, also known as the Affordable Care Act (ACA) has had a significant impact on our health insurance program and premiums as it includes per capita fees for a national study commissions. Uncertainties about what will happen on the Federal level causes many to ask what they can expect for coverage in the future, but that is not something we can predict. Other than wages and salaries, it represents one of the largest single costs to the Town. The reporting requirements for this new mandate are extensive and complex. We work closely with the Comptroller’s Office to be sure records for each individual are correct, as they become a part of reporting to the IRS. All employees, other than Police and Fire, are covered by Workers’ Compensation, a federally mandated program. Our goal is to prevent accidents and lost time from work, and to protect individuals from financial loss when there is an incident. This “no fault” insurance is designed to provide income security and medical coverage for individuals injured on the job. Since July 2011, the program has been insured with MIIA. Human Resources continues to ensure that incident reports are filed timely with Worker’s Compensation. We are now able to file claims “on line” to get them set up quickly so employees are treated and claims processed quickly. Employees who have needed to use the services report a strong and positive experience working with claims managers. We also work with managers and employees across the Town to support safe work practices, so that the frequency and length of workers’ compensation and 111F absences are held to a minimum. The number and severity of incidents has been reduced significantly and we appreciate the work of all employees who practice safe work habits. Our goal is to get each employee back to their job as quickly as they can perform their tasks safely. There is no benefit to anyone who needs to be out for a work related injury. 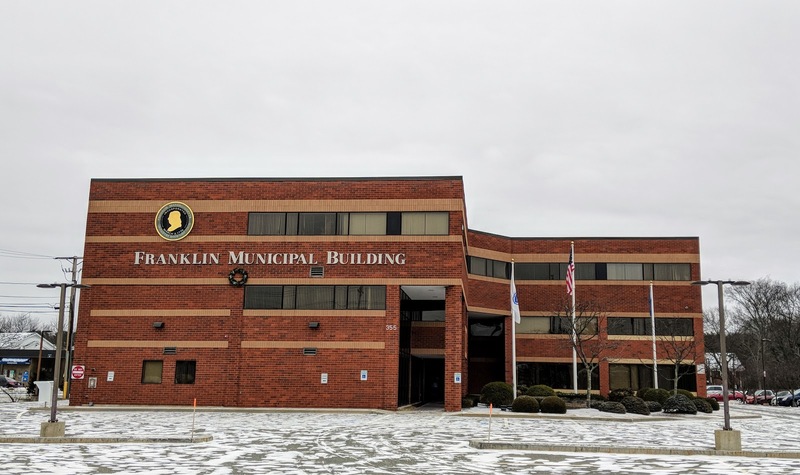 The Town of Franklin Safety Committee monitors practices and policies, with an eye to reducing hazards at the worksite. In the future, this committee will be under the arm of the Deputy Town Administrator. We provide benefits that are competitive with the market to attract and keep the right workforce and provide those quality benefits at the lowest cost possible. We review all benefit programs on a regular basis to be sure they comply with Federal and State laws. We continue to work to comply with all new reports and regulations. Over the coming year this will continue to add complexity as we coordinate changes at the Federal level with state regulations, or locally negotiated agreements. We provide benefits that are competitive with the market to attract and keep the right workforce and provide those quality benefits at the lowest cost possible. In addition to active employees we are responsible for over 550 retirees and spouses of retirees of the Town of Franklin and Franklin Public Schools who have health and/or life insurance as a result of their long-term employment with the Town. All retirees from the Town and School Department are cared for in the Human Resources Department. Retirees contact our office with changes to their health insurance programs as they move around the country and become eligible for Medicare. We enjoy hearing about their activities after they have left employ with the town. As retirees are a very mobile population, it is our goal and mission to assist all retirees and their covered spouses with any questions they might have which includes the processing of all of their enrollment, coverage and address changes on a daily basis. They receive mailings each year as health insurance plans and rates changes. Complete the successful transition for the new Human Resources Manager. A new perspective will bring new opportunities to deliver services. Seek opportunities to streamline processes and reduce paper processes while remaining in compliance with state and federal requirements. Work with all departments to maintain a safe work environment, to reduce lost time from on the job injuries. Review return to work options for employees who have been out on Workers’ Compensation or 111F. Review best practices in the public sector and find opportunities for skill development to offer to municipal employees. Continue to monitor changes arising from National Health Care Reform. Identify the various workload activities, and ensure proper documentation and training. Partner with School HR activities to find service improvements and cost-efficiencies. Deliver high quality customer service to employees, retirees, and citizens. Constantly monitor full range of benefit options. Focus on the Health Insurance Program. Identify information which can be best communicated electronically and keep web site current. Provide excellent service to and resolve administrative issues arising from municipal health insurance program. Facilitate managers using job descriptions and performance evaluations to strengthen organizational and employee performance. Support managers and employees in employee relations activities. We appreciate our employees and retirees and look forward to another year of providing timely and useful service to them. It has been my pleasure to serve the Town as Human Resources Director, and wish all well in the coming years.